These cookies are buttery and shortbread-ish. And delicious. Have I mentioned how much I love Dorie recipes? Unfortunately, it appears I am not a talented log roller, as these cookies came out a little angled and squared rather than round. Fortunately the funky shape does not affect their amazing taste! Working with a stand mixer, preferably fitted with a paddle attachment, or with a hand mixer in a large bowl, beat the butter at medium speed until smooth and very creamy. Add the sugars and salt and beat until well blended, about 1 minute. The mixture should be smooth and velvety, not fluffy and airy. Reduce the mixer speed to low and beat in two of the egg yolks, again beating until the mixture is homogeneous. Turn off the mixer. Pour in the flour, drape a kitchen towel over the stand mixer to protect yourself and the counter from flying flour and pulse the mixer at low speed about 5 times, a second or two each time. Take a peek — if there is still a lot of flour on the surface of the dough, pulse a couple more times; if not, remove the towel. Continuing at low speed, mix for about 30 seconds more, just until the flour disappears into the dough and the dough looks uniformly moist. (If most of the flour is incorporated but you’ve still got some in the bottom of the bowl, use a rubber spatula to work the rest of the flour into the dough.) The dough will not clean the sides of the bowl, nor will it come together in a ball — and it shouldn’t. You want to work the dough as little as possible. What you’re aiming for is a soft, moist, clumpy (rather than smooth) dough. Pinch it, and it will feel a little like Play-Doh. Center a rack in the oven and preheat the oven to 350 degrees F. Line two baking sheets with parchment or silicone mats. Remove a log of dough from the refrigerator, unwrap it and place it on a piece of parchment or wax paper. Whisk the remaining egg yolk until it is smooth, and brush some of the yolk all over the sides of the dough — this is the glue — then sprinkle the entire surface of the log with decorating sugar. Trim the ends of the roll if they’re ragged, and slice the log into 1/3-inch-thick cookies. (You can make these as thick as 1/2 inch or as thin as — but no thinner than — 1/4 inch.) Place the rounds on the baking sheets, leaving an inch of space between them. Bake one sheet at a time for 17 to 20 minutes, rotating the baking sheet at the midway point. When properly baked, the cookies will be light brown on the bottom, lightly golden around the edges and pale on top; they may feel tender when you touch the top gently, and that’s fine. Remove from the oven and let the cookies rest a minute or two before carefully lifting them onto a rack with a wide metal spatula to cool to room temperature. Repeat with the remaining log of dough, making sure the baking sheets are cool before you bake the second batch. Serve these with anything from lemonade to espresso. The cookies will keep in a tin at room temperature for about 5 days. 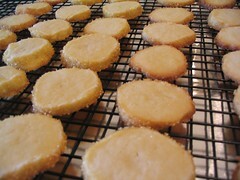 If you do not sprinkle the sables with sugar, they can be wrapped airtight and frozen for up to 2 months. Because the sugar will melt in the freezer, the decorated cookies are not suitable for freezing. I used Turbinado (Sugar in the Raw) sugar. I put the first batch in for 17 minutes as the recipe says and the cookies came out really dark. The rest of them I baked for about 14 minutes. These look like such a nice compliment to the World Peace Cookies. I can picture rows of both cookies on a cookie tray. Paula, you’re right! And the best part is, they are both so easy to make, and the dough can be frozen for months at a time. I think I may make a couple batches and stick them in the freezer so I can have cookies if I need them in a pinch. They look mouth watering. I have always loved Sables. One one you can round out the dough is to put the log into a paper towel roll. You need to make the log slightly larger than the roll and press it (in the parchment paper) into the roll. Also, I’ve found out that pressing on the log while cutting can also cause squaring. I have made so many cookies in my life but have never made sables. I need/want to give them a try! Looks good. Wow, I’ve never even heard of sables. What do I know? It’s been a while sine I made refrigerator/rolled cookies. I like the effect of the sugar just on the edges. Besides using the paper towel tube trick, I like to rotate the roll about 1/4 of the way after I slice to help keep the roll from turning into a square. I love this book and still have a number of things marked to try, these included! I gave up making “round” refrigerator cookies and now just make them square. It makes me feel so much better about my skills that way. I love cookies esp munching them with a strong cup of coffee, the sables really look good .Will try this recipe one of these dayz. Bye .